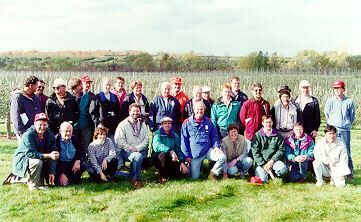 A photo gallery of the 1995 post-meeting tour of western New York orchards. Win Cowgill, Rutgers Cooperative Extension. Does he have enough cameras? heck, what's the difference!) get their digital picture taken (photograph taken with Apple QuickTake Digital Camera).
" Hey, Win! Just take the #$@* picture!"